Search engine optimization (SEO) is the process of increasing the visibility of a website or a web page to users of a web search engine. The term excludes the purchase of paid placement, referring only to the improvement of unpaid results (known as "natural" or "organic" results). SEO is performed because a website will receive more visitors from a search engine the higher the website appears in the search results page. These visitors can then be converted into customers. SEO may target different kinds of search, including image search, video search, academic search, news search, and industry-specific vertical search engines. SEO differs from local search engine optimization in that the latter is focused on optimizing a business' online presence so that its web pages will be displayed by search engines when a user enters a local search for its products or services. The former instead is more focused on national or international searches. As an Internet marketing strategy, SEO considers how search engines work, the computer programmed algorithms which dictate search engine behavior, what people search for, the actual search terms or keywords typed into search engines, and which search engines are preferred by their targeted audience. Optimizing a website may involve editing its content, adding content, modifying HTML, and associated coding to both increase its relevance to specific keywords and to remove barriers to the indexing activities of search engines. Promoting a site to increase the number of backlinks, or inbound links, is another SEO tactic. By May 2015, mobile search had surpassed desktop search. In 2015, it was reported that Google was developing and promoting mobile search as a key feature within future products. In response, many brands begun to take a different approach to their Internet marketing strategies. To avoid undesirable content in the search indexes, webmasters can instruct spiders not to crawl certain files or directories through the standard robots.txt file in the root directory of the domain. Additionally, a page can be explicitly excluded from a search engine's database by using a meta tag specific to robots (usually <meta name="robots" content="noindex"> ). When a search engine visits a site, the robots.txt located in the root directory is the first file crawled. The robots.txt file is then parsed and will instruct the robot as to which pages are not to be crawled. As a search engine crawler may keep a cached copy of this file, it may on occasion crawl pages a webmaster does not wish crawled. Pages typically prevented from being crawled include login specific pages such as shopping carts and user-specific content such as search results from internal searches. In March 2007, Google warned webmasters that they should prevent indexing of internal search results because those pages are considered search spam. ^ Ortiz-Cordova, A. and Jansen, B. J. (2012) Classifying Web Search Queries in Order to Identify High Revenue Generating Customers. Journal of the American Society for Information Sciences and Technology. 63(7), 1426 – 1441. ^ "Inside AdWords: Building for the next moment" Google Inside Adwords May 15, 2015. ^ Brian Pinkerton. "Finding What People Want: Experiences with the WebCrawler" (PDF). The Second International WWW Conference Chicago, USA, October 17–20, 1994. Retrieved May 7, 2007. ^ "Intro to Search Engine Optimization | Search Engine Watch". searchenginewatch.com. Retrieved June 29, 2017. ^ Danny Sullivan (June 14, 2004). "Who Invented the Term "Search Engine Optimization"?". Search Engine Watch. Archived from the original on April 23, 2010. Retrieved May 14, 2007. See Google groups thread. ^ "Trademark/Service Mark Application, Principal Register". Retrieved May 30, 2014. ^ "Trade Name Certification". State of Arizona. ^ Cory Doctorow (August 26, 2001). "Metacrap: Putting the torch to seven straw-men of the meta-utopia". e-LearningGuru. Archived from the original on April 9, 2007. Retrieved May 8, 2007. ^ Laurie J. Flynn (November 11, 1996). "Desperately Seeking Surfers". New York Times. Retrieved May 9, 2007. ^ Jason Demers (January 20, 2016). "Is Keyword Density Still Important for SEO". Forbes. Retrieved August 15, 2016. ^ "AIRWeb". Adversarial Information Retrieval on the Web, annual conference. Retrieved October 4, 2012. ^ David Kesmodel (September 22, 2005). "Sites Get Dropped by Search Engines After Trying to 'Optimize' Rankings". Wall Street Journal. Retrieved July 30, 2008. ^ Adam L. Penenberg (September 8, 2005). "Legal Showdown in Search Fracas". Wired Magazine. Retrieved August 11, 2016. ^ Matt Cutts (February 2, 2006). "Confirming a penalty". mattcutts.com/blog. Retrieved May 9, 2007. ^ a b "Google's Guidelines on Site Design". google.com. Retrieved April 18, 2007. ^ a b "Bing Webmaster Guidelines". bing.com. Retrieved September 11, 2014. ^ "Sitemaps". google.com. Retrieved May 4, 2012. ^ "By the Data: For Consumers, Mobile is the Internet" Google for Entrepreneurs Startup Grind September 20, 2015. ^ Brin, Sergey & Page, Larry (1998). "The Anatomy of a Large-Scale Hypertextual Web Search Engine". Proceedings of the seventh international conference on World Wide Web. pp. 107–117. Retrieved May 8, 2007. ^ "Google's co-founders may not have the name recognition of say, Bill Gates, but give them time: Google hasn't been around nearly as long as Microsoft". October 15, 2008. ^ Thompson, Bill (December 19, 2003). "Is Google good for you?". BBC News. Retrieved May 16, 2007. ^ Zoltan Gyongyi & Hector Garcia-Molina (2005). "Link Spam Alliances" (PDF). Proceedings of the 31st VLDB Conference, Trondheim, Norway. Retrieved May 9, 2007. ^ Hansell, Saul (June 3, 2007). "Google Keeps Tweaking Its Search Engine". New York Times. Retrieved June 6, 2007. ^ Danny Sullivan (September 29, 2005). "Rundown On Search Ranking Factors". Search Engine Watch. Archived from the original on May 28, 2007. Retrieved May 8, 2007. ^ Christine Churchill (November 23, 2005). "Understanding Search Engine Patents". Search Engine Watch. Archived from the original on February 7, 2007. Retrieved May 8, 2007. ^ "Google Personalized Search Leaves Google Labs". searchenginewatch.com. Search Engine Watch. Retrieved September 5, 2009. 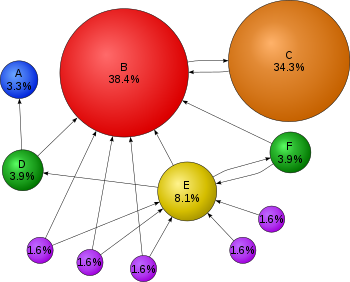 ^ "8 Things We Learned About Google PageRank". www.searchenginejournal.com. Retrieved August 17, 2009. ^ "PageRank sculpting". Matt Cutts. Retrieved January 12, 2010. ^ "Google Loses "Backwards Compatibility" On Paid Link Blocking & PageRank Sculpting". searchengineland.com. Retrieved August 17, 2009. ^ "Personalized Search for everyone". Google. Retrieved December 14, 2009. ^ "Our new search index: Caffeine". Google: Official Blog. Retrieved May 10, 2014. ^ "Relevance Meets Real-Time Web". Google Blog. ^ "Google Search Quality Updates". Google Blog. ^ "What You Need to Know About Google's Penguin Update". Inc.com. ^ "Google Penguin looks mostly at your link source, says Google". Search Engine Land. October 10, 2016. Retrieved April 20, 2017. ^ "FAQ: All About The New Google "Hummingbird" Algorithm". www.searchengineland.com. Retrieved March 17, 2018. ^ "Submitting To Directories: Yahoo & The Open Directory". Search Engine Watch. March 12, 2007. Archived from the original on May 19, 2007. Retrieved May 15, 2007. ^ "What is a Sitemap file and why should I have one?". google.com. Retrieved March 19, 2007. ^ "Search Console - Crawl URL". Google. Retrieved December 18, 2015. ^ "Submitting To Search Crawlers: Google, Yahoo, Ask & Microsoft's Live Search". Search Engine Watch. March 12, 2007. Archived from the original on May 10, 2007. Retrieved May 15, 2007. ^ "Mobile-first Index". Google.com. Retrieved March 19, 2018. ^ Phan, Doantam (November 4, 2016). "Mobile-first Indexing". Official Google Webmaster Central Blog. Google. Retrieved January 16, 2019. ^ "Newspapers Amok! New York Times Spamming Google? LA Times Hijacking Cars.com?". Search Engine Land. May 8, 2007. Retrieved May 9, 2007. ^ a b "The Most Important SEO Strategy". clickz.com. ClickZ. Retrieved April 18, 2010. ^ "Bing – Partnering to help solve duplicate content issues – Webmaster Blog – Bing Community". www.bing.com. Retrieved October 30, 2009. ^ Andrew Goodman. "Search Engine Showdown: Black hats vs. White hats at SES". SearchEngineWatch. Archived from the original on February 22, 2007. Retrieved May 9, 2007. ^ Jill Whalen (November 16, 2004). "Black Hat/White Hat Search Engine Optimization". searchengineguide.com. Retrieved May 9, 2007. ^ "What's an SEO? Does Google recommend working with companies that offer to make my site Google-friendly?". google.com. Retrieved April 18, 2007. ^ Andy Hagans (November 8, 2005). "High Accessibility Is Effective Search Engine Optimization". A List Apart. Retrieved May 9, 2007. ^ Matt Cutts (February 4, 2006). "Ramping up on international webspam". mattcutts.com/blog. Retrieved May 9, 2007. ^ Matt Cutts (February 7, 2006). "Recent reinclusions". mattcutts.com/blog. Retrieved May 9, 2007. ^ "Introduction to Search Engine Optimization: Getting Started With SEO to Achieve Business Goals" (PDF). ^ Tapan, Panda (July 2013). "Search Engine Marketing: Does the Knowledge Discovery Process Help Online Retailers?". IUP Journal of Knowledge Management; Hyderabad. 11 (3): 56–66 – via Proquest. ^ Melissa Burdon (March 13, 2007). "The Battle Between Search Engine Optimization and Conversion: Who Wins?". Grok.com. Archived from the original on March 15, 2008. Retrieved April 10, 2017. ^ "Search Quality Evaluator Guidelines" How Search Works November 12, 2015. ^ Titcomb, James. "Mobile web usage overtakes desktop for first time". www.telegraph.co.uk. The Telegraph. Retrieved March 17, 2018. ^ Andy Greenberg (April 30, 2007). "Condemned To Google Hell". Forbes. Archived from the original on May 2, 2007. Retrieved May 9, 2007. ^ Matt McGee (September 21, 2011). "Schmidt's testimony reveals how Google tests algorithm changes". ^ Jakob Nielsen (January 9, 2006). "Search Engines as Leeches on the Web". useit.com. Retrieved May 14, 2007. ^ Graham, Jefferson (August 26, 2003). "The search engine that could". USA Today. Retrieved May 15, 2007. ^ Greg Jarboe (February 22, 2007). "Stats Show Google Dominates the International Search Landscape". Search Engine Watch. Retrieved May 15, 2007. ^ a b c Mike Grehan (April 3, 2006). "Search Engine Optimizing for Europe". Click. Retrieved May 14, 2007. ^ Jack Schofield (June 10, 2008). "Google UK closes in on 90% market share". London: Guardian. Retrieved June 10, 2008. ^ "Search King, Inc. v. Google Technology, Inc., CIV-02-1457-M" (PDF). docstoc.com. May 27, 2003. Retrieved May 23, 2008. ^ Stefanie Olsen (May 30, 2003). "Judge dismisses suit against Google". CNET. Retrieved May 10, 2007. ^ "Technology & Marketing Law Blog: KinderStart v. Google Dismissed—With Sanctions Against KinderStart's Counsel". blog.ericgoldman.org. Retrieved June 23, 2008. ^ "Technology & Marketing Law Blog: Google Sued Over Rankings—KinderStart.com v. Google". blog.ericgoldman.org. Retrieved June 23, 2008. Google I/O 2010 – SEO site advice from the experts on YouTube – Technical tutorial on search engine optimization, given at Google I/O 2010. This page was last edited on 20 April 2019, at 10:08 (UTC).